The following are the latest results contributed by HM Courts Service, for cases sentenced by West Sussex Magistrates’ Court sitting at Worthing from June 15 to 22. Adrian Sluzewski, 31, of William Street, Bognor Regis, was fined £145 and must pay £30 victim surcharge, £85 costs, after admitting driving over the 30mph speed limit in Hotham Way, Bognor Regis, on September 7, 2017. His driving record was endorsed with three points. Jennifer Balch, 33, of Somerset Gardens, Bognor Regis, was fined £167 and must pay £30 victim surcharge, £85 costs, after admitting assaulting a police constable in the execution of her duty in Chichester on June 2, 2018. Paul Baty, 30, of Hartland Court, Emsworth, was fined £200 and must pay £30 compensation, £30 victim surcharge, £40 costs, after admitting assaulting a police constable in the execution of his duty in Southbourne on June 4, 2018. He also admitted being drunk and disorderly in Hurstwood Avenue, Southbourne, on June 4, 2018, no separate penalty. Ashley Gould, 25, of Hurstwood Avenue, Southbourne, was fined £220 and must pay £30 victim surcharge, £40 costs, after admitting assaulting a police constable in the execution of his duty in Southbourne on June 4, 2018. He also admitted being drunk and disorderly in a public place, in Hurstwood Avenue, Southbourne, on June 4, 2018, no separate penalty. Jamie Macdonald, 31, of White Laithe Walk, Whinmoor, was fined £120 and must pay £30 victim surcharge, £85 costs, after admitting drug-driving (5.8ug/l Delta-9-THC) in Lagness Road, Chichester, on February 13, 2018. He was disqualified from driving for 12 months. Liam Brock, 28, of Hudson Road, Southsea, was fined £300 and must pay £30 victim surcharge, £85 costs, after admitting drink-driving (84mg of alcohol in 100ml of breath) in West Street, Bognor Regis, on June 3, 2018. He was disqualified from driving for 20 months. 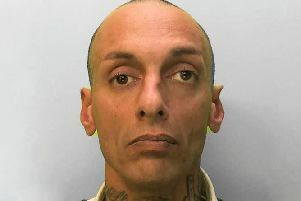 James Buckman, 25, of Summers House, Forest Road, Midhurst, was given a community order with Rehabilitation Activity Requirement and must carry out 120 hours’ unpaid work after admitting drink-driving (66mg of alcohol in 100ml of breath) in Chapel Street, Chichester, on June 5, 2018; possessing cocaine in Chichester on June 5, 2018; and wilfully obstructing a police constable in the execution of his duty in Worthing on June 5, 2018. He must pay £85 victim surcharge and was disqualified from driving for 42 months. He also admitted driving without insurance, no separate penalty. Liam Lawlor, 25, of Gorse Avenue, Bognor Regis, was fined £300 and must pay £30 victim surcharge, £85 costs, after admitting drug driving (4ug/l Delta-9-THC) on the A280 Clapham on March 12, 2018. He was disqualified from driving for 12 months. He was also fined £50 after admitting possessing 13g of cannabis in Clapham on March 12, 2018.